Travis Landon, a police detective in Bismarck, North Dakota, loses his wife and unborn daughter in an automobile accident. Then his father is diagnosed with Alzheimer's disease, and moves in with Travis. Hoping for a fresh start, Travis accepts a position as deputy sheriff in the town of Tranquility, Massachusetts.Soon after Travis arrives in Tranquility, the town's chief of police leaves on a two-week honeymoon. Travis agrees to fill in as temporary police chief. And trouble begins. An elderly farmer vanishes, and a strange woman and her two sons are living in the missing man's farmhouse.Meanwhile, two hundred miles away, in Concord, New Hampshire, a young woman is abducted by a man who has been stalking her. 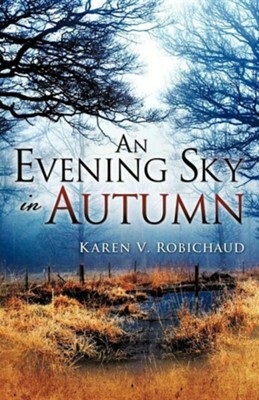 She escapes and runs for her life to a safe haven in Tranquility with her abductor in close pursuit.While resisting an intense attraction to each other, Travis and his striking deputy, Lane Avery, attempt to solve the mystery of the missing farmer, and stop the stalker before he tracks down and harms the young woman.Karen V. Robichaud is the author of the Leigh Falls suspense series, including Leigh Falls, Where the River Flows, and Beyond Winter's Shadow. She lives in Fredericton, New Brunswick. I'm the author/artist and I want to review An Evening Sky in Autumn.